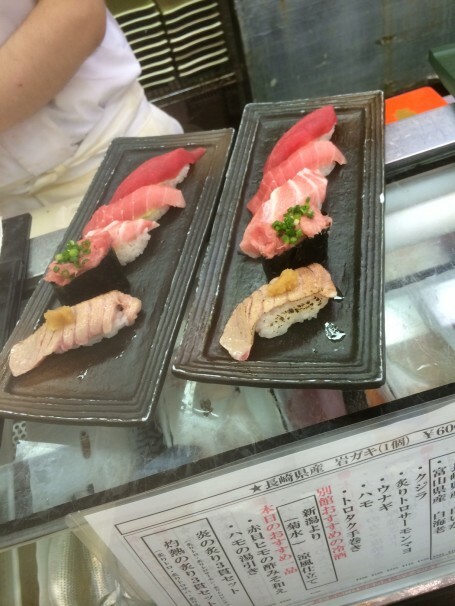 Tsukiji Fish Market has the best sushi. Period. I visited the market around noon after deciding not to brave the usual 3am tuna auction, or the subsequent 6am lineup for freshly caught sushi. Besides, I don’t think my palette is refined enough to taste the difference between sashimi caught an hour ago and that caught 6 hours ago. The first thing we saw when we entered the market was a giant tuna sitting out in front of a restaurant. It was by far the largest fish I had ever laid eyes on. As we walked through the market, various vendors offering fresh seafood bombarded us with sales and special prices. 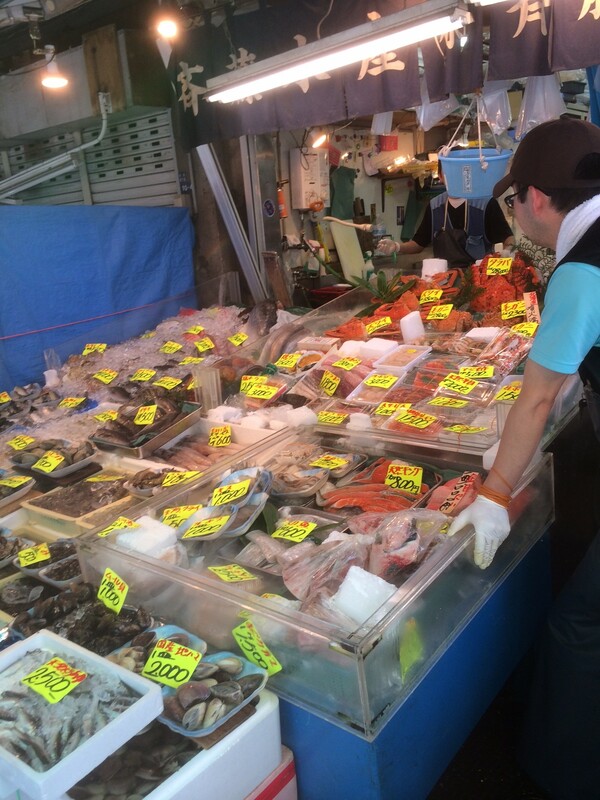 We decided to wander around the market some more before sitting down for lunch. There were many food stands selling various items, such as Himalayan salt, almonds, dried seaweed, dried fish, and even sushi-shaped candy. It was a great place to buy souvenirs. We also found a store selling various cooking supplies. Unsure about which restaurant to visit, we simply chose the restaurant with the longest line. Originally we had wanted to try Sushi Dai, but it was unfortunately closed on Sundays. We waited approximately 45 minutes for what would be the freshest, most delicious sushi I’ve ever tasted in my life. After being seated at the counter, the chef immediately greeted us and recommended a some menu options. We decided to order piece-by-piece as opposed to the chef’s choice. The first piece of sushi we had was called o-toro, or fatty tuna. It was by far my favorite cut of fish. The meat literally melted in my mouth as I took the first bite. I also acquired a taste for Japanese wasabi while at this restaurant because it complemented the raw fish so well. Wasabi in the U.S. is typically dyed horseradish, and not nearly as tasty. I find sushi’s place in Japanese culture to be very interesting. To many chefs, being able to prepare and serve sushi is not only a culinary skill, but also an art form. 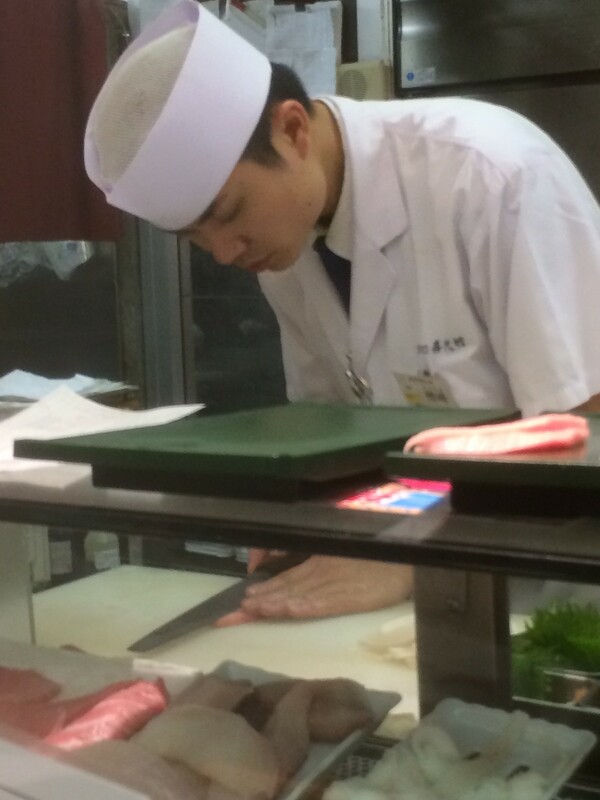 Perhaps it is the influence of perfectionist attitudes within the Japanese culture, but chefs train for years just to be able to correctly slice fish. 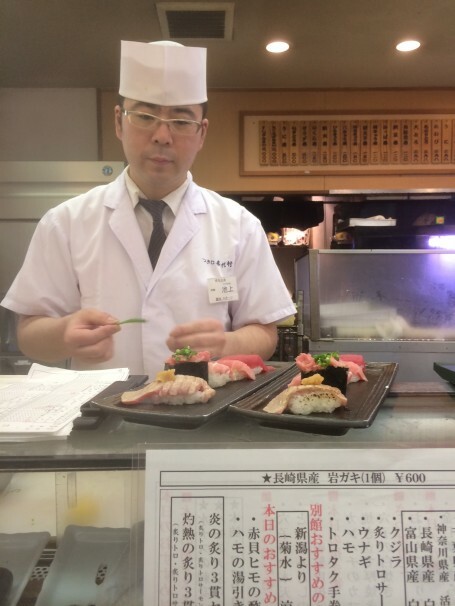 In the documentary Jiro Dreams of Sushi, apprentices must first learn how to correctly hand out hot towels, then spend years learning how to cook rice, while training for 10 years just to learn how to properly cook eggs. It goes without saying that Japan takes its sushi culture very seriously. 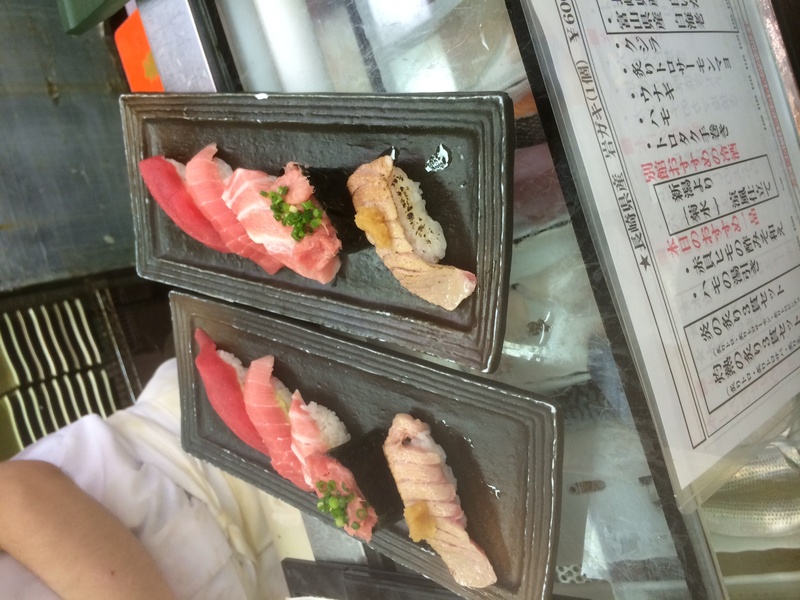 Overall, we had a delicious meal at Tsukiji Fish Market, but now, unfortunately, I can never have sushi in the U.S. again. Thank you, Japan. You have spoiled me rotten.